* Measures sound level from 40 to 130dB with a Frequency Weighting for human hearing and fast response time of 125ms. * Pocket-sized housing with easy one-button operation. * Large, backlit LCD display. * Tripod mount (tripod not included). * Complete with 9V battery. 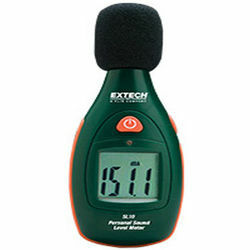 Compact, One-Button Operation Sound Level Meter * Measures sound level from 40 to 130dB with a Frequency Weighting for human hearing and fast response time of 125ms. * Pocket-sized housing with easy one-button operation. * Large, backlit LCD display. * Double-molded side grip. * Tripod mount (tripod not included). * Complete with 9V battery. * A Quality product from Extech, USA.